Order poke weed seed now! 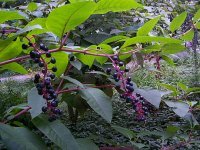 Other Common Names: Pokeweed, Poke salat, Poke sallat, Polk sallat, Poke salad, Poke Berry Plant, Pokeberry, Poke berries, Poke Root, Polkweed, Polk salat, Polk salad, Polkberry, Polk berries, Polk Root, Poke, Polk, American Pokeweed, American Pokeweed, Scoke, Pigeonberry, Pigeon berry, Ink weed, Inkweed, American Poke, American Pokeweed, Bledo Carbonesro, Cancer-root, Hierba Carmin, Pocan, Pokeroot, Reujin D Ours, Sekerciboyaci, Yoshu-Yama-Gobo, Yyamilin, Phytolacca Root, Phytolaccae Radix, Phytolacca Berry, Garget, M�choacan du Canada, Bear's Grape, Raisin d'Am�rique, Red-ink Plant, American Spinach, Crowberry, Jalap, American Nightshade, Cokan, Coakum, Chongras, Morelle � Grappes, Herbe de la Laque, Amerikanische scharlachbeere, Kermesbeere, Virginian Poke, Garget Weed. Germination: Medium. For best germination it is recommended to soak seed in concentrated sulfuric acid for 5 minutes to imitate the process to the deterioration of the seed coat in a bird's stomach. Notes: Dye plant. Very Poisonous! Phytolacca americana Dye plant. Very Poisonous! BULK Poke Seeds Are Available!